October 1, 2007: Comet Encke never knew what hit it. "We were speechless when we saw this," says Angelos Vourlidas of the Naval Research Lab in Washington, D.C. "I kept playing the movie over and over." 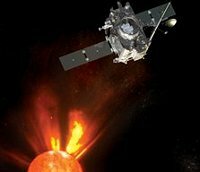 Vourlidas is part of a team of NRC researchers who built the Heliospheric Imager telescope onboard STEREO-A that recorded the event. He's also the lead author of a paper reporting the collision in the Oct. 10 issue of the Astrophysical Journal Letters. The eruption that hit Encke was a CME or "coronal mass ejection." Sky watchers on Earth are familiar with CMEs because of the auroras they create when they occasionally hit our planet. CMEs are fast-moving and massive, packing billions of tons of solar gas and magnetism into billowing clouds traveling a million-plus miles per hour. Actually, it is a little surprising that a CME succeeded in ripping off a comet's tail. For all their mass and power, CMEs are spread over a large volume of space. The impact of a gossamer CME exerts little more than a few nanoPascals of mechanical pressure—softer than a baby's breath. "We believe the explanation is 'magnetic reconnection,'" says Vourlidas. Magnetic fields around the comet bumped into oppositely directed magnetic fields in the CME. Suddenly, these fields linked together--they "reconnected"--releasing a burst of energy that tore off the comet's tail. A similar process takes place in Earth's magnetosphere during geomagnetic storms powering, among other things, the aurora borealis. "In a sense, the comet experienced a geomagnetic storm," says Vourlidas. "It is the first time we've ever witnessed such an event on another cosmic body." "Although STEREO is primarily designed to study CMEs and their impact on Earth, we hope this CME strike on Encke will provide insights to scientists studying comets as well," adds Mike Kaiser, STEREO project Scientist at NASA's Goddard Space Flight Center. Among astronomers, Encke is one of the most famous and important comets. It was only the second comet named, after Halley itself, and it is the shortest-period comet known. Encke loops around the sun once every 3.3 years compared to, say, once every 75 years for the more typical Halley. Encke's short period combined with its trajectory inside the orbit of Mercury means it may have been blasted by CMEs more often than any other comet routinely observed by astronomers. Could this have some effect on the comet's nature and evolution? "We don't yet know." Vourlidas' team is only beginning to study all the data gathered by STEREO. The spacecraft carries a suite of five different telescopes (collectively known as SECCHI) each optimized for a different kind of observation ranging from wide-angle views of CMEs at visible wavelengths to pinpoint maps of sunspots through high-resolution ultraviolet filters. The Heliospheric Imager movie represents just a fraction of the total dataset. In the months ahead, "we're going to be looking at the CME-comet interaction in much greater detail to understand the processes at work," says Vourlidas. Encke may not know what hit it, but NASA scientists soon will. STEREO, short for Solar Terrestrial Relations Observatory, is actually a pair of spacecraft, A and B, widely separated to provide stereo views of the sun. STEREO-A was in position to see Comet Encke when the CME struck. STEREO is the third mission in NASA's Solar Terrestrial Probes program. The HI instrument was built in the U.K. by Rutherford Appleton Laboratory and the University of Birmingham with major contributions from NRL and the Centre Spatial de Liege, Belgium. The Naval Research Laboratory is the Department of the Navy's corporate laboratory. NRL conducts a broad program of scientific research, technology, and advanced development. The Laboratory, with a total complement of nearly 2,500 personnel, is located in southwest Washington, with other major sites at the Stennis Space Center, MS; and Monterey, CA. STEREO is sponsored by NASA's Science Mission Directorate and is managed by the Goddard Science and Exploration Directorate.